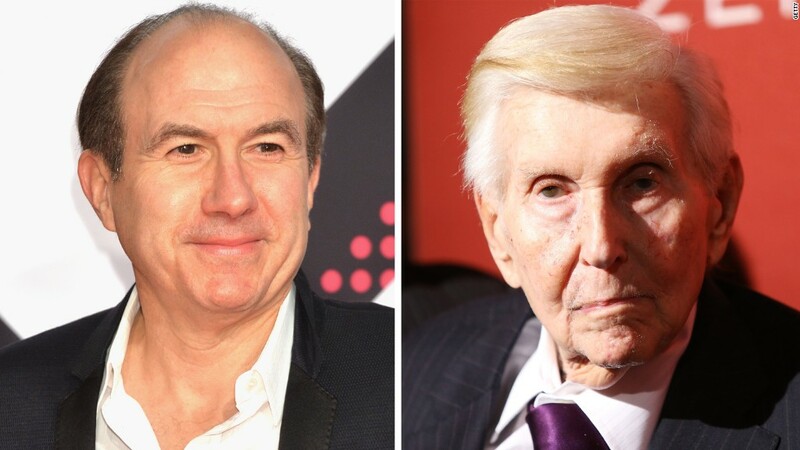 Viacom controlling shareholder Sumner Redstone has officially split with his protege and friend of 30 years, the man who's running Viacom for him, CEO Phillippe Dauman. And now the two men are taking the dispute to court. On Monday morning, Dauman filed suit to block what he called an "unlawful corporate takeover." "We all continue to have great respect and affection for Mr. Redstone, but he is clearly being manipulated by his daughter, Shari," Dauman said in a statement. Shari Redstone said the accusation is "absurd." Clearly something cataclysmic is going on. Redstone and Dauman have been exceedingly close since the late 1980s, but no more. On Friday evening, lawyers for Redstone said the ailing 92-year-old mogul had decided to remove Dauman and another Viacom board member, George Abrams, from the trust that will control both Viacom and CBS after his death. The move appeared to give Shari Redstone more control over the sprawling media empire. Now Dauman and Abrams want a Massachusetts court to invalidate their removal from the trust. The suit seeks "immediate judicial relief." Dauman accused Shari Redstone of hijacking her father's "well-established estate plan by removing professional managers and reportedly installing her daughter, an employee and a friend who are firmly under her control." Sumner Redstone responded a few hours later by petitioning another court, the Los Angeles County Superior Court, for support. A Redstone spokesman said his attorneys "filed a petition asking for an order confirming the validity of his actions." The spokesman said Redstone "has the right to remove or add trustees unless he is 'incapacitated.'" The lawsuit heightens the stakes in a corporate governance crisis at Viacom (VIA), one of the biggest media companies in the world. Viacom owns MTV, Nickelodeon, Comedy Central, Paramount and a long list of other television and movie assets. The company is under intense scrutiny amid upheaval in the media industry; its stock has fallen about 40% this year. Dauman remains in charge, but maybe not for much longer, since Sumner Redstone is the controlling shareholder in the company and Shari Redstone is the vice chair of the board. This dispute has been heading toward a boiling point for a while. Redstone and his daughter were once estranged, but are now back in each other's lives. At the same time, tensions have risen between Redstone and Dauman. Earlier this year, when Redstone gave up his Viacom chairman position, Shari was the sole board member to vote against Dauman's ascension to the chair. Friday was the next salvo. A spokesman for the elder Redstone said he worked with a team of lawyers to remove Dauman and Abrams from the trust. Viacom, speaking for Dauman, called the action "invalid and illegal" and questioned Redstone's competency. A recent court case involving an ex-girlfriend raised the same questions -- Redstone was depicted as a "living ghost," unable to take care of himself -- but the judge sided with Redstone. This is where it gets complicated. During the court proceedings, Dauman was on Redstone's side, testifying that Redstone was "engaged" and "attentive" despite his inability to speak. On Friday, however, Viacom said "Redstone now lacks the capacity to have taken these steps." In other words, the company blamed Shari. As statements flew back and forth, Shari said on Saturday, "I fully support my father's decisions and respect his authority to make them." On Sunday night, a new spokesman for Redstone got involved. A lengthy statement sent "on behalf of Sumner" seemed to confirm news reports that Redstone is opposed to Dauman's plan to sell a minority stake in Viacom's Paramount Pictures movie studio. "Unless Viacom's board presents a concrete plan that convinces him otherwise, Mr. Redstone continues to believe that it is in the best interest of Viacom that Paramount Pictures should remain wholly owned by the parent company," said Mike Lawrence, the spokesman. Lawrence denied several of Viacom's claims, including an allegation that members of the corporate board have been "denied access" to the mogul. He asserted that Redstone "asked to be briefed" about Viacom's business by Abrams and another board member, Fred Salerno, last Monday, "but the board leadership did not respond." Viacom responded on Sunday night by noting that Redstone listened in to board meetings for the next two days, last Tuesday and Wednesday. "Despite numerous requests," Salerno and a "fellow board member, who represent all shareholders, have still been unable to meet with Mr. Redstone," Viacom said. The Viacom statement added, "The Sumner Redstone we knew would never refuse a meeting about his businesses and he certainly would not want advisors to stand in for him." Those board members would still like to meet with Redstone, Viacom said. But Lawrence said earlier in the evening that "Viacom's false and unfair statements to the media, as well as Mr. Dauman's opportunistic claims of incapacity, now make it problematic to move forward with any direct meeting and briefing as Mr. Redstone had previously requested." "However," Lawrence added, "Mr. Redstone remains intent on receiving the briefing through his advisors -- a request that still has not been responded to despite Mr. Redstone's rights as a director." Bottom line: The two sides aren't speaking, except through combative public statements.